You can also use a outdoor fingerprint reader (50 euros on ali) and combine it whith a cheap modded door sensor for unlock. First of all great work in making this app. I'm a newbe at homey, but this one is getting my working done easier. I do have a question about my Philio 4 in 1 sensor (D-B-T-L). I use this on the front door and wanted it to trigger the delay status if the door is opened AND if a motion is detected. It only seems to do this when the door is opened which is great when you are away and the Surveilance Mode is Activated. But when I come done in the morning and the Surveilance Mode is partially Activated I want it also to trigger me to turn of the alarm. I don't have sensors that have both capabilities (contact and motion) in one device so I can't test on it but I've included a minor change in the version (1.0.4) that is submitted (and waiting for approval by Athom) that should show improvement. Having Heimdall trigger 'if the door is opened AND if a motion is detected' will not happen, the first detection on a device will trigger the delay/alarm. I have a Neo touch near the front door, just a single press and the alarm is disabled. not that secure but no intruder will know that. Thanks for the answer. You say the first detection on a device will trigger the delay/alarm. So if I am at home and activate the alarm, walking down to the hallway will trigger the alarm because of the motion in the Philio? That would be great! I stated my question a bit wrong, I did not wanted to trigger the alarm only if both door open and motion are detected, but I want to trigger the alarm if the door is open (so when somebody comes in) or when motion is detected (when I come donw in the morning). I will wait for the update. What are you using here to alert you to turn of the alarm when you come home yourself? In the early days I had an alarm system were the keypad was making a beep to tell me the alarm is turned on and has to be turned of. Yes, that's how it should work. That is, when the Philio sensor is working as desired. If you were to have two separate devices (so 1 doorsensor and 1 motion sensor) it would already function like that, I hope I can get it working like that with the Philio sensors too. All going great with the app, many thanks for doing this and the regular updates. Can it be that the app remembers its alarm state after a power cut and comes back on "alarmed" if that was its state before the power cut ? My system has started doing something weird this eve. That's right, any Surveillance Mode and Alarm State change is saved instantly so it will survive a power loss, that's by design. That may be related to the update. Just to be sure; the sensor you're testing this has Yes in the Delayed Trigger column on the Settings page? Saying you 'have alarm and arming countdown ticked' make me think you are talking about settings on the speech page. I guess it's caused by the fact the sensors are already in a tripped state before arming, I've just tested this (and before publishing this version) again and it works like it should. The current version should give better support for the Philio 4 in 1 sensors, could you please test if the sensor now reports movement and an open/closed state when you trigger that particular sensor of the device? This is the best app ever. Really nice job done! I think i might have discovered a potential bug. @vaderag Could you post a screenshot of the flow you mention? There is no condition card that checks if a Surveillance mode is being armed, only if it is armed. So when you are arming with a delay the condition card will not be true (when checking for the armed state) until the countdown is done. Oh right, well that probably explains that! I had done some testing and the armed state seemed to activate the moment the countdown started (ie. Being armed is part of the armed state), but sounds like you're saying that being armed is still part of the unarmed state? The sensor does report movement and open/closed state when triggered. Although I would like it to do it better, but perhaps that is something of the sensor itself (maybe there are better ones). Yes, when the alarm is being armed (so when an arming countdown is running) the Surveillance Mode is still disarmed. The condition card will validate disarmed, the history will show disarmed and the status indicator on the Dashboard will show disarmed. But here's the catch: The Surveillance Device (on your phone or in the devices view) will show the Surveillance Mode that is being countdown towards. This sounds weird but makes sense because a) you can easily switch to Disarmed when desired b) When setting the Surveillance Mode from the Surveillance Device you would have selected the new desired mode. So it will only be noticed when you set a Surveillance Mode via a flow AND use a Arming Delay AND use the Surveillance Device to check the state. Great, thanks for testing and your feedback. I see. That makes sense and explains why my testing showed what I thought! The tampering detection that some sensors have like for example the Aeotec MultiSensor 6 or the Fibaro Motion Sensor will now also be used as a trigger for devices you have selected in an Armed Surveillance Mode. Today I added two extra door sensors (Xiaomi Aqara Zigbee) and they show in the Homey interface and correctly report their status and are visible in the zigbee developers page, but do not show up in Heimdall. The previously added door sensors are shown in Heimdall. I haven't played with Heimdall for I while, perhaps I have to let the App know these two sensors should be added? 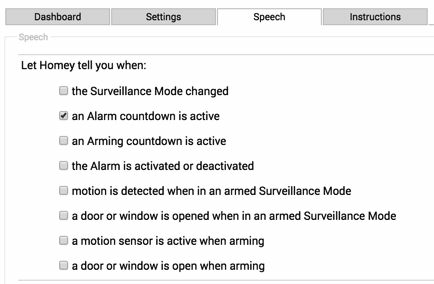 Normally new sensors that have capabilities that Heimdall supports (alarm_motion, alarm_tamper and alarm_contact) show up in the devices overview on the settings page immediately after adding them. Can you try to restart the app? When the app is started it will go through all devices. I had already restarted the App, that didn't work. After that I soft booted Homey. Still no extra door sensors. Now I will PTP and wait 10 minutes.